A session will be held Thursday, April 11 for men and their wives (if married) seeking information about a call to the permanent diaconate. Sponsored by the Archdiocese of Philadelphia’s Office for Clergy and the School of Diaconal Formation at St. Charles Borromeo Seminary, the Information Night will take place 7-9 p.m. in Vianney Hall at the seminary. Deacons are ordained clergy of the Catholic Church who are called to be ministers of the Word at the altar and ministers of charity. In short, permanent deacons receive the sacrament of holy orders and can preach the Gospel, officiate at baptisms, weddings and funerals, and serve as public witnesses to the faith. Historically the diaconate is the second order of ministry created in the church. The first to be created were the bishops who were the Apostles and their successors, then deacons beginning with St. Stephen and his companions were given duties of service. Priests came later to assist the bishops in ministry and were given the added faculties to celebrate Mass, hear confessions and anoint the sick. Over time, the diaconate was absorbed as a step toward priesthood and it remained so until it was restored in 1967 by Pope Paul VI to its original purpose, a ministry of service, through the ordained permanent diaconate. Priests are still ordained transitional deacons as a final stage in their formation. Permanent deacons’ ministry can include proclaiming, preaching and teaching God’s Word, assisting the bishop and priests at the liturgy, assisting at funerals, ministering to the sick and dying, leading the community in prayer and in sacramental liturgies, baptizing, witnessing marriages and exercising administrative leadership in the church. Practically speaking, just how many of these duties an individual deacon will perform depends upon his superior, usually the pastor of a parish where he is assigned. Also, it is usually a part-time ministry as most permanent deacons are married, many with children and full-time employment. In spite of this they are not laymen — they are ordained clergy. In Philadelphia, permanent deacons commit to 10-12 hours of service to their parish, according to Deacon Michael Pascarella, associate to the vicar for clergy in the Department of Permanent Deacons. This time commitment may vary by parish and by time of year, for example in Holy Week with its special and frequent liturgies. 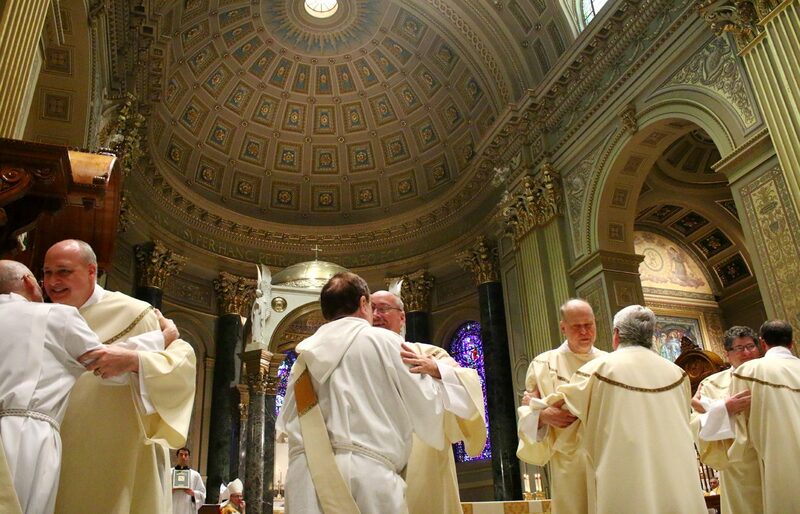 Part of the problem is permanent deacons tend to be much older than priests at ordination. Canonically a man may be ordained a priest as young as 25, but the beginning age for permanent deacons is 35, actually the same required minimum age for a priest to be named a bishop. But that’s not the challenge. According to Deacon Pascarella the average age of men in the Philadelphia Archdiocese entering the program for the permanent diaconate is 50, so they will be 57 when ordained. This would suggest most are married men who are waiting until their children are mostly grown before they enter the program. It is a seven-year program from the time of application, including one preliminary year and six years of study. In fact the most recent Archdiocesan Catholic Directory listed more permanent deacon deaths than priests’ deaths, although there are more priests than deacons in the archdiocese. While an applicant need not be a college graduate, the training program is rigorous and leads to a masters’ degree for those with an undergraduate degree who wish it. Others receive a certificate, but all take the same courses. Classes are held one or two nights per week following a college semester calendar. There are also eight Saturday workshops and a summer weekend retreat. In the end, it leads to a rewarding and blessed new vocation, well worth the time and effort. Today, most applicants are suburbanites and there is a special need for men willing to minister in the city, especially in African American and ethnic communities. The greatest need at this time is more applicants willing to minister in the city. Anyone wishing to attend the Information Night for the Permanent Diaconate must preregister with the following details to Laura Nimmons at lnimmons@archphila.org: name, address, age, email, parish and marital status (if married, wife’s name). For more information on the permanent diaconate see the website of St. Charles Borromeo Seminary.